This is a historical timeline of noteworthy events in Big Bear’s history. It was started by my very good friend and local historian Tom Core, who passed away in 2006. The Timeline is continually updated, with new entries being added as additional information becomes available. A Mexican sheep herder was shot by Bear Valley cowboys when caught butchering a calf, and pulled a gun on the cattlemen. The site was then named “Deadman’s Lake”. Today it is known as “Lake Williams”. The Mentone and Big Bear Valley Toll Road Company obtained a charter to build a wagon road to Thurman’s Ranch. From there, burros had to be ridden up the divide, then down to Seven Oaks on the Santa Ana River. On June 10th, Gus Knight, Jr., and John Metcalf, Jr., opened their new Bear Valley Hotel that could accommodate 30 guests. This was the first resort accommodations available at the new Big Bear Lake. The hotel was located just south of today’s Big Bear Village. In August, Gus Knight, Jr., bought 280 acres of State School land located between Baldwin Lake and Sugar Loaf Mountain. Congress passes the Forest Reserve Act, “one of the most far-reaching laws in the annals of American land policy”. The Bear Valley Wagon Road Company contracted for a new road to be built from Grout Bay (Fawnskin) to intersect with Danaher’s City Creek Road at present Fredalba. This is now Forest Service 2N13, and is also called the Snowslide Road. In August Engineer W. C. Butler had a crew start working on a new Bear Valley dam. It was 150 feet below the rock dam, and the space between the two dams was to be filled with waste rock. A bunk house for the crew was built, and a hoist and derrick installed. This project was never completed. First trip of tri-weekly Wilshire Stages left Redlands May 15 for Bear Valley. The trip to Knight and Metcalf’s Bear Valley Hotel took one and a half days with a fare of $7. The first telephone line into Big Bear Lake, connected the Bear Valley Dam with San Bernardino Valley. Cattle ranching in the mountains was expanding. George Rathbun and Will Talmadge went into partnership on the IS Ranch at Big Bear Lake. Gus Knight, Sr., was grazing 175 head south of Baldwin Lake. John Metcalf had 100 head at Bear Valley. First forest protection created by congress, the 737,280 acre San Bernardino National Forest Preserve. But no administrative officers or rangers were appointed. 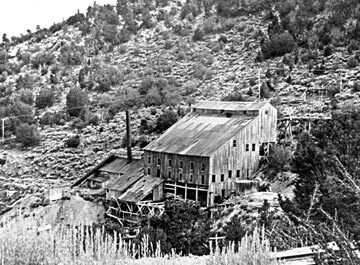 Mining was active all around Big Bear Lake with the Valley Gold Company in Holcomb Valley, the Blackhawk Mine, and the Rose Mine, but Bud Doble had abandoned operations at the Gold mountain Mine in Big Bear. Gus Knight helped incorporate the Bear Valley and Redlands Toll Road Company who proceeded to build a road into the Big Bear Valley that replaced the 1860 miner’s trail from the Santa Ana River. A new Gold Mountain forty Stamp Mill in Big Bear rapidly took form as 40 carpenters and millwrights worked under the critical eye of Captain De La Mar. Poles were set across the desert from Victor for a new telegraph line to the mine. That summer, the new Gold Mountain Mine Stamp Mill was successfully processing the stained quartz ore from the active mine. On the flat below, nearly 200 people occupied the town of Doble, and a new post office opened on July 27th. On December 24, (Christmas Eve) a mysterious fire destroyed the Knight Hotel at Bear Valley. The buildings had been closed for the winter and were snowbound. The cause of the fire was never determined. 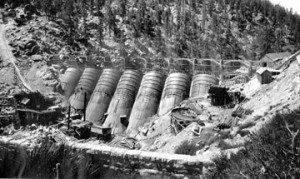 Mining activity was so high in Big Bear Lake, that the Gold Mountain Mine was running two shifts and crushing 130 tons of ore a day. L. M. Holt proposed to the City of Redlands that they consolidate several water companies, and that a higher dam should be built at Big Bear Valley to replace Frank Brown’s rock dam in order to guarantee future water supplies. Much dissatisfaction existed with the four toll roads into the San Bernardino Mountains. Maintenance was poor, and the charges were excessive. The forest now had over 80,000 visitors a year. A free county road was demanded. Around this year the name Big Bear Lake came into general use to separate it from newly developing Little Bear Lake which would eventually become known as Lake Arrowhead. San Bernardino County took over the Arrowhead Toll Road. It would now be toll free, but automobiles were forbidden to use it. Gus Knight, Sr., died and his Bear Valley ranch, 600 cattle, and 25 horses were sold to Bill Shay. The first circular trip through the mountains in an automobile was made on August 27. John A. Heyser and two other men in a White steam car left San Bernardino at 8 a.m. They went via Santa Ana Canyon, Clark Grade, Bluff Lake, Big Bear Lake, Green Valley, the Crest Road to Pinecrest, Waterman Canyon, and back to San Bernardino arriving at 9:30 p.m. Their elapsed time was a remarkable 13 hours and 17 minutes. News of the event were reported in newspapers across southern California. The County supervisors received a petition asking that automobiles be allowed to use the Waterman Canyon road. A test with seven cars was made without incident. Thereafter, cars were allowed to use the road, but only on certain days and hours. The Forest Service connected their numerous locations with a network of telephone lines. E. J. “Lucky” Baldwin passed away, and Thomas H. Oxnam purchased the Gold Mountain Mine and mill in Big Bear from the estate. 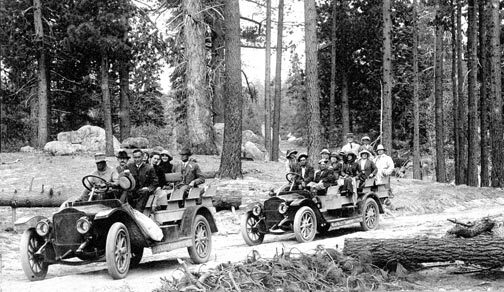 John (Fritz) Fisher and friends drove two Model T Ford Runabouts from Redlands to Big Bear via the desert road, arriving in the valley on the evening of June 26. Taking two days, the running time for the 105 mile trip was 14 hours and 40 minutes. John S. Eastwood was awarded a contract to build a new higher dam at Big Bear Lake to replace the Rock Dam built in 1882. It would be built on a new concept using multiple thin wall concrete arches for strength instead of mass. Talmadge and other freight wagons were busy hauling steel and cement from the railroad at Victorville to the site of the new Big Bear Lake dam. The infant motion picture industry discovered that westerns were popular with audiences, and that the San Bernardino Mountains were an inexpensive place to film. Consequently, on March 9, the Essanay Company announced the one reel “Romance of the Bar 0” was finished, which may be the first movie ever made in these mountains. The first large production company in Big Bear arrived on July 10th when the Bison Motion Picture Company used five large wagons to haul scenery and equipment up from the railroad. There were also 6 canoes, 26 horses, 8 expert riders, and 28 actors and actresses. During their two month stay, they often completed a picture each day! These films were usually one reel long with a projection time of about 12 minutes. The new Eastwood multiple arch concrete dam at Bear Valley was completed. The new dam would nearly triple the amount of water in Big Bear Lake. Four wealthy Redlands men purchased the old Pine Lake Hotel, and it’s 44 cabins from Bill Glass. (Knight’s & Metcalf’s, original Bear Valley Hotel). The name of the resort was soon changed to the Pine Knot Lodge. The Forest Service established a system to provide men and equipment to fight future forest fires. Kirk Phillips started the Mountain Auto Line to Big Bear Lake with a new White truck. Will Talmadge’s two sons, Otis and Will, Jr. drowned in Big Bear Lake in October when their boat sank during a freak storm. On October 22, Shay and Brooks made the first scheduled trip of their auto bus line from Redlands to Big Bear Lake using the Santa Ana Canyon road. Gus Knight, Bear Valley Road Supervisor, received county instructions to rebuild the road from Grout Bay in Big Bear Lake to the Brookings City Creek Road for automobile traffic. Some ex-Brookings employees were hired for the project. Long stretches of the old logging railroad were made into roads for auto use. John and Frank Talmadge, Jr., bought the Metcalf Ranch in Big Bear with it’s 1200 cattle. They went into partnership with brother Will, combining all into the famous IS Ranch brand. World Champion Boxer James J. Jeffries purchased the first lot in Gus Knight Jr.’s new Homestead Tract subdivision in Bear Valley. The county began construction on a Mill Creek road to Big Bear Lake using prison labor. The Pine Knot Lodge, managed by Fritz Fisher, added 20 new cabins, while many interior improvements were made through the winter. By this time, the entire village had adopted the name “Pine Knot”. 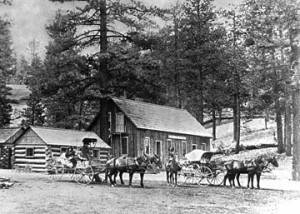 Kirk Phillips’ Mountain Auto Line with nine White stages, brought hundreds of tourists to Big Bear Lake over the still unfinished Mill Creek Road. Clifford Lynn and Ed Moyer set up a sawmill on Gilner Point on Big Bear Lake. Some logs would come from trees drowned by the rising lake waters. Will Shay and C. O. Barker purchased from the estate of the late E. J. Baldwin all 3,500 acres of his pasture land beside Baldwin Lake, and 600 head of cattle for $30,000. Grimes, Harmon, and Hitchcock were grazing cattle on the old Holcomb Valley placer grounds. County Supervisors gave a September tour to the press over the newly completed Crest Highway, and the long circular trip through the mountains and Big Bear Lake could now be completed with relative ease. Charles Oxnam, taking over for his ill father, remodeled the old Gold Mountain Mill, and brought up supplies to start operations again. Kirk Philips, the energetic founder of the Mountain Auto Line, passed away at age 35 from an emergency operation. His close partners, Perry and Max Green assumed the operation of the flourishing company. The deepest snow in years blanketed the mountains, and the ice was over a foot thick on Big Bear Lake. In September, a fire at the Pine Knot Lodge at Big Bear destroyed the dining room, kitchen, and office. Rebuilding was started before the ashes had hardly cooled. Fish and Game had a new $1400 hatchery on North Creek at the south end of Boulder Bay. The “101 Mile Rim of the World Drive” through the mountains was dedicated on July 17 and 18 with a large crowd attending, including over a hundred newsmen to spread the word.